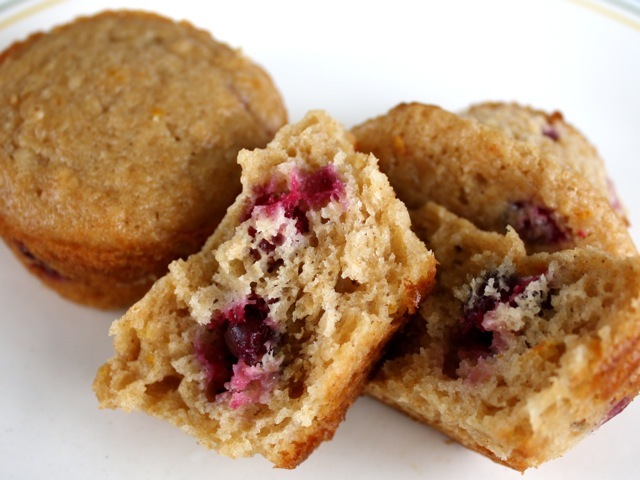 This recipe was inspired by a muffin concoction in The Barefoot Contessa Cookbook, but uses the always-reliable proportions of the Muffins recipe from the Joy of Cooking. Position a rack in the center of the oven. Preheat the oven to 400 degrees. Grease two standard 12-muffin pans or line the pans with paper or silicone cupcake liners. In a large bowl, whisk together thoroughly the flours, baking powder, salt, and spices. In another bowl, whisk together the eggs, milk or cream, sugars, butter, oil, and vanilla. Add the cranberries, zest, and nuts, if using. Add the dry ingredients to the wet ingredients and mix together until the dry ingredients are just moistened. Do not overmix; the batter should not be smooth. Divide the batter among the muffin cups, filling each cup ⅔ full. Bake until a toothpick inserted into a muffin comes out clean, about 12 to 18 minutes depending on how big the muffins are. Rotate the pans halfway through baking. Let cool for 2 to 3 minutes before removing from the pan. If not serving hot, let cool on a rack. Serve as soon as possible, preferably within a few hours of baking. You can replace some or all of the milk/cream with plain yogurt, buttermilk, or sour cream; just add 1/2 tsp. baking soda to the dry ingredients. If you want to use the juice of the zested orange, use it to replace part of the milk.